The Sag Moon was void this morning until 11:59 AM. Actually, that’s totally untrue. But that’s what it says in my Jim Maynard Celestial Calendar. The Sag Moon is actually void between 7:47 PM and 11:59 PM ET tonight. Can you tell that Mercury just turned direct on Sunday at 12:25 AM ET? Hope you are taking it slow, double checking it thrice. Once the Moon is fully engaged in Capricorn, the drive is to take care of business — though at 5:53 AM ET on TUESDAY, that business may have more than the usual gravitas when it meets up with controlling/authoritative Saturn. Moon continues in Capricorn until THURSDAY at 12:56 PM ET. Adding to the proactive vibe is Mars, now moving back through Capricorn with high efficiency….if only it weren’t retrograde. That’s a caveat that whatever is accomplished with ease and innovation now may not satisfy once Mars turns direct, which it will do NEXT MONDAY. How wonderful to read Tarot Diva Beth Owl’s Daughter’s wonderful Card of the Week, having written the paragraph above – check it out! By the time we get to the weekend, emotions are likely to be on the rise. SUNDAY we’ll have a Full Moon in Pisces, facilitating empathy (an upside), on a day when Venus (money, women, social expression, values) is super-charged by ruthless Pluto. A charged connection between Venus and Pluto facilitates emotional overkill (downside); depth and intensity (upside); and purges (depends on which side you’re on). On that day, Mars (energy, assertion, aggression) will be at a standstill — and thus in high focus — as it prepares to move forward (finally!) next MONDAY AM. UPDATE: on Kevin Spacey, whose horoscope was last discussed in November 2017. Back then, I anticipated that transiting Pluto’s square to his Aries Midheaven would likely reflect a dramatic change in public status, for better or for worse. That may have happened on August 11th. Not only that, but his Leo Sun and Ascendant were affected by July’s total lunar eclipse. Witness this headline, announcing the weekend box office for his new film — Billionaire Boys’ Club. Total take: $618. Ouch. UPDATE: on Jimmy Carter, who is feeling the love of transiting Jupiter on his Scorpio Moon — and last week, transiting Venus conjunct his Libra Sun…and transiting Sun conjunct his Leo Venus-Neptune. Here’s a total feel-good piece about modesty, humility and grace — all part of the simple life he and his wife Rosalyn enjoy in Plains, Georgia. He may be the richest ex-president ever. UPDATE: speaking of ex-presidents, Barack Obama’s Mercury (how he needs to think and communicate) has been supercharged all summer, with exact hits from innovative Uranus and persuasive Pluto exact in July, August and September. Here’s his summer reading list, filled with “empathy, understanding and ‘factfulness'”. Looks like he’s up for an expansive, active next few months. It’s baaaack! The “Fat Leonard” scandal involving corruption in the U.S. Navy, as in “Fat Leonard Scandal Grows, With Indictment of Three More Retired Navy Officials.” Of course it does! And finally…Neptune refers to music, too. Now there’s a new best-selling album of all-time, displacing Michael Jackson’s “Thriller.” Oh, it gets even better. Scorpio is the Scorpion…but also the Eagle. Guess which band now holds the record? And now, a few words about the situation that landed on my plate two weeks ago, demanding attention at the expense of all else — including writing this forecast and other articles;: reminding cherished clients that they’re due for an annual check-up; revamping my outdated website; drafting outlines for the classes I plan to teach; thanking an Avid Reader for her generous contribution to my Cosmic Tip Jar (a thank you note will arrive soon), yadda yadda yadda. Oh dear FB friends….you know how much I am in love with the beautiful six-story tall elm tree outside my window. It was well below eye-level when I bought this apt years ago, and has been for the last several years a daily blessing in every season. From every window in my apt, I look out into cool, soothing green in spring and summer. Brilliant hues of red and orange in fall….snow-covered branches in the winter. Crows camp at eye level when the temperature drops below freezing. It has been humbling to watch their daily routines, as they return year after year. There are squirrels and sparrows…and other birds you rarely see on the ground: cardinals, red finches, blue jays, woodpeckers…sometimes a red-tailed hawk and often, mourning doves. Yesterday I was captivated by a dragonfly — a first. The tree offers shade, beauty and privacy. 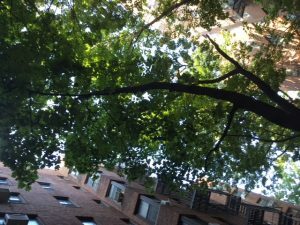 Instead of looking into the windows of neighbors in the harsh, sterile red brick building across the street, I am surrounded by lush greenery. Every day I give thanks for the bounty of these twin elm trees — and as far as I know, they are safe. There is ANOTHER courtyard in our building — an interior one, sorely in need of TLC. Once there was a grand fountain with multi-level pools cascading down a slope. That has been filled in with dirt — years ago. Still, there are at least a dozen soaring maple trees — touching the sky above the roof of the building. It is like a rain forest canopy — not much sunlight, but the shade is soothing — and squirrels and more birds make their homes in the branches. It has been my wish that our building would take the initiative to clean up the courtyard — put in some plants that can thrive with little sunlight — maybe cover the ground with moss, like you see in gardens in Japan. Add some benches; repair the crumbling walls in the back; cover the chainlink fence with bamboo. Let it be a cherished nature refuge all residents may enjoy. Right now residents “aren’t allowed” in the courtyard. So guess what “management” is doing instead? They are planning to “renovate” the courtyard, though it is not clear if the plan includes access for residents (!). The plan — kept only to themselves — is to destroy most of the maple trees. They have marked them with splotches of red paint. — for death — supposedly the execution happens on Monday. I found this out last night — and have been sick to my stomach and sick at heart ever since. I am weary weary weary of reading every day in the papers about how the P45 administration is trashing the environment — and feeling so powerless to do anything about it. This hurts even more because it is literally happening in my backyard — a place I like to think of as “safe.” What foolish, wishful thinking — and what a teachable moment, hmm? No place is safe — especially if we (and in this case, specifically me) are not vigilant. Our coop board is as transparent as Scott Pruitt’s $43K soundproof booth — and that’s way they like it. It seems to be easier to maintain power and control, than any other alternative (e.g., soliciting input from the other 148 owners in this 155-unit building) — so can you blame them? Shareholders/Residents have not been told the specifics of the plan….only a mention that “some trees” in the courtyard would be removed at the shareholders meeting in May (which I could not attend because I was out of town — my total bad). NOTHING has been sent to shareholders in writing. Our board does not send out minutes from shareholder meetings…they run as a slate year after year, unchallenged. To effect a change would require energy and focus that I have been pouring into Other Obvious Things (like work — both professional and volunteer) — and even if I had the energy, I could not effect change all by myself. Now I am beating myself up for not making the effort years ago…and feeling already beaten down by the insanity of destroying a dozen healthy, towering, decades-old, irreplaceable maple trees (along with every other horrific headline on today’s front page). Surely there must be another way to “renovate” a courtyard in ways that are less destructive. I have considered the possibility that I may be overreacting…and may not be aware of all of the facts that would require consideration, but this seems to me an unconscionable plan. This is the courtyard now — stripped of shrubbery — with the maple trees now on death row. Also pictured: the “offending” towering canopy. In other news, don’t let this happen to you! Have you checked your voter registration status lately? If you do not vote in every election, do not assume you are still on the roster. Check your status and/or register here https://www.vote.org/am-i-registered-to-vote/ We must be resolved to have a say in the process! Facebook can be a wonderful sounding board, and within an hour I received validation and empathy from caring souls. I also received encouragement: “Call the management company!” “Rally your neighbors!” “Sign a petition!” Which is frankly what I would advise any other friend or client facing a similar challenge. But it’s daunting…y’know…especially when it feels like you have to do it alone. But those trees! And the pain I was certain my neighbors would feel if they were cut down…. I took a deep breath…and called a neighbor who is on our co-op board. Thankfully she is also a friend. Later, in her apartment I asked her why the trees were being cut down. “Because nothing will grow back there!” she said, with utmost sincerity. I do not recall replying that the 60-year-old trees apparently did not receive that memo — but certainly I was thinking it.